Residence at Lieu Multiple for Hospes Project. The "real presence" has something distinctive and that is absolutely its own , completely irreplaceable. And telepresence knows that, and therefore is named "tele – presence". It is not a presence without anything else. It is a presence that refuses itself as a true presence, recognizing his "distant" (tele) character. But such a denial does not reduce the whole idea of its "presence" in some sense. Here is a dialectic, that is, an inherent contradiction to the concept of "tele – presence". Its utopian character is just identified with that contradiction. It is a claim that is denied. What telepresent CAN NOT be present, but we cling stubbornly to this utopia . Carnival is a distributed telepresence system based on electronic and digital devices, which we call modules. 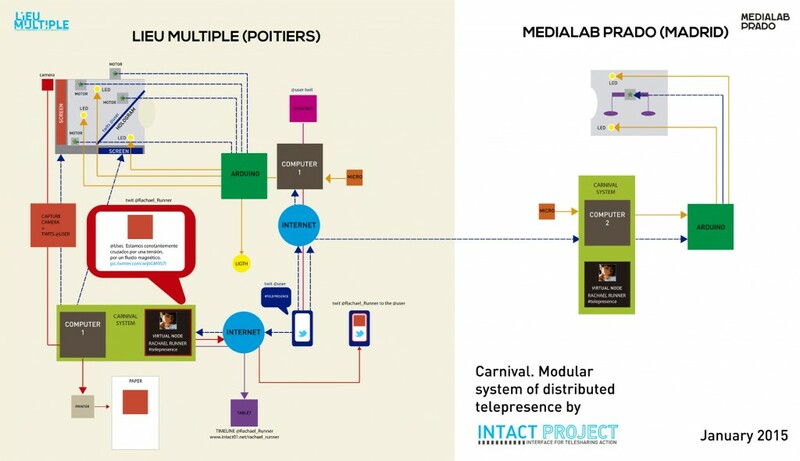 Carnevale creates a network of interconnected assets facilitating the exchange of data in real time between two or more points and simultaneously opens a passage in cyberspace for the incorporation of other presences and interactions. Therefore, the experience of telepresence can be distributed in space and projected to other spaces in fragments. This system will manage different modes of arrival at the remote space and even cyberspace. In other words, Carnevale proposes the deconstruction of presence and its projection to distance reformulated by the peculiarities of the system that distributes them. For this system we have been built boxes where each one contains a different device (webcam, micro, speakers, tablet, motors, printer and lights), all of them connected to the Internet network through a computer. We can create countless modules and connect and distributed in countless ways . This installation exemplifies the use of the Carnival system and introduces us to the conceptual universe of INTACT Project. 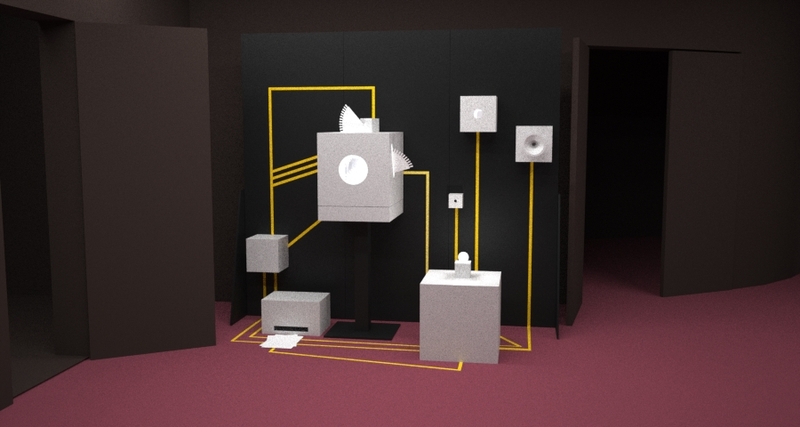 The artwork speaks of the fundamental dialectic of telepresence, that is: the telepresence as utopia of the permanent and global connection , not only technological but also sentimental and emotional . The utopia of telepresence responds to the drama of the distance and the absence. It is the dialectic of the united against the separated. Of the open against the closed. The isolation against the common place. Why undertake a utopian task ? The motor of telepresence cannot be anything other than our desire to " gather " to break the monologue of the mass media and open to the spontaneous emergence of new voices and presences. Expand ourselves towards the other and let the other invade us . It is also the dialectic of human beings and their definition as an individual and a collective, as a human being that can remain confined and isolated, or that open up and break up into new forms of presence and awareness .
" It is now time to understand that machines have come to extend the horizons of man, to save you the effort with their collaboration and attach it to an exact embrace of jagged networks without imprisoning his soul" José Val del Omar ( 1904-1982 ) . timelapse Carnival installation from INTACT on Vimeo.